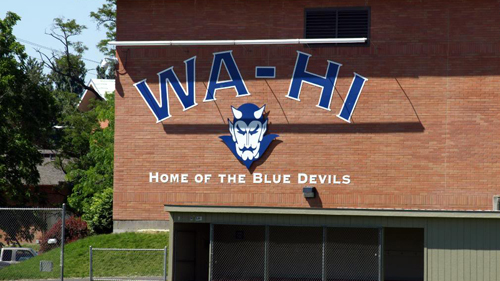 Traveling to the Bermuda Triangle of high school sports always makes for an interesting game, and this year's trip to Walla Walla was no exception. Despite being overseen by an officiating crew only Rod Serling could appreciate, the Bombers came away with a 35-14 win, and plenty of memorable moments, over the Blue Devils. Among the memories were plenty of phantom holding calls (that's not so unusual), a downed runner jumping to his feet and tacking an extra ten yards onto the spot, and a truly bizarre fourth quarter that featured a second down played six consecutive times, a fumbled snap called as a snap infraction, and a player ejected for fighting while the two teams were separated by several yards. While it would have been nice to get a second straight shutout, a win is a win. The scoreless first quarter breezed by, punctuated by good Richland runs called back on penalties and thunderous punts by both sides. Junior AJ Storms is proving to be a worthy replacement for the injured Nate Mitchell, at one point sending a kick well over 50 yards in the air. As the first quarter rolled into the second, Richland's tough D line put the pressure on, corralling the QB on the first play as linebacker Camron Ball torpedoed through to take him down, then Kade Powell and Daniel VanGorkum dropped the running back for a loss to force the punt on fourth down and 25 to go. As the snap sailed over the punter's head, VanGorkum and fellow lineman Sam Stanfield made a beeline for him. Desperately trying to get rid of the ball before something bad happened, a quick kick was blocked by VanGorkum as he and Stanfield hit the kicker simultaneously. With the ball delivered directly to VanGorkum's gut at the two yard line, it was easy money for the Bombers. Initially headed left to a hole opened by Aric Davison and Brian Dean, Dhaunye Guice hopped back to his right and easily made it past the pile created by Geoff Robinson, Joe Hawkins, and Caden Glaze. 7-0 Bombers. With the help of two completed passes and a wild play in which the Blue Devil running back, after being upended by Cody Sanderson and Ball, decided to try his luck and continue running for an extra 15 yards before being stopped by Ryan Kriskovich and Stephon Sanders. The referees generously rewarded the effort with another first down. After being stuffed and pressured on the next three plays, the WW QB fired an early bullet to avoid being crushed by Davison. Ben Fewel moved in front of the pass and snagged it at the 15. He was rewarded on the next play with a pass down the left sideline, his go route getting him just across midfield. It was more easy pickings from there, as Guice took the ball at the 10, headed right, cut a hard left between sophomore Mason Williamson and Dean, and then headed straight up field for his second score. After a three-and-out by Walla Walla, a 60 yard drive was capped by a 19 yard Kriskovich touchdown catch to round out the half. Another defensive stand lead to a 14 play drive that included a big catch by Drew Daves on fourth and 12 and a 22 yard catch and run by Kriskovich. The scoring play at the end of the drive started out with Josh Fonner looking right, seeing nothing, and then changing directions and rolling out left on a completely empty field. Sprung free by Davison's brutal block on a D lineman, Fonner only had to wait for the perfect moment to throw a lob to Kriskovich streaking along the back line. After a false start the second PAT attempt brought the score to 28-0, although the scorekeeper refused to add the point for the remainder of the game, despite being urged to do so by the visiting crowd, the visiting coaches, and the game officials. One of the highlights of the game was a big punt return by Kriskovich. Bringing the ball in at the Bomber 35, he faked right and went left up the visitor's sideline. Initially sprung loose with good blocks by Jordan Ly and Andrew Fairchild, Kriscovich's cut to midfield at the Blue Devil 40 was assisted by Ball and Jack Schuster. Weaving his way between defenders, he was barely brought down by his ankle as he stepped over a juked defender. From the 10 yard line it looked like more easy points. Two failed rushing attempts later, Fonner dropped an easy pass to Marshawn Davis-Copeland coming from right to left just on the other side of the scrum, taking it in for another six points. Joey Weissenfels' PAT made it 35-0 with time left in the third quarter (34-0 if you believed the scoreboard). The last few minutes of the third showed that Richland's JV might not quite be ready for varsity primetime as they allowed consecutive first downs on the ground, and then a screen pass for 35 yards. The starters came back in for a first and goal from the five yard line and successfully forced a second down, but that's where it got weird. False start, pass interference, false start, and a fumbled snap, easily recovered by Stanfield and yet nullified by a late flag for a snap infraction, lead to a desperate heave by the QB, as he was being leveled by Robinson, to the front of the endzone, where the receiver grabbed the ball and fell over the line to end the shutout. By some miracle there was no false start on the PAT. 35 (or 34)-7. The second Blue Devil touchdown came on a breakdown at linebacker coupled with good blocking in the secondary. A short pass went for big yardage, giving Walla Walla a shot from the 10 yard line, where the same receiver grabbed the ball on a cross and made it 35-14. A 55 yard touchdown catch by Ben Fewel was called back on an illegal receiver penalty (it was difficult to tell since the officials weren't using a field mic). The offending lineman was difficult to spot on the game film, so that call call must also remain a mystery. Fighting back from first down and 22 proved too difficult, but another big punt from Storms and good coverage by Nathan Craig downed the ball at the Walla Walla three yard line. The defensive starters (absent Ball, who had been ejected in an alleged kerfuffle during the legendary six second down escapade) forced a punt from the endzone, which Kriskovich returned back to the 20. The Bombers burned up the rest of the clock bashing the ball up the middle, finally ending the game at 35 (not 34)-14. Next up is winless Southridge, playing at Fran Rish, where the Suns haven't been able to win since 2005. It isn't likely to be a suspenseful game, but it is homecoming. It would be great to have Bomber alumni pack the stadium and witness another win.